If we cannot build out sideways, perhaps we should try building upwards? That is the thought process which more and more British home-owners are going through. 1) Make a hard-headed assessment of whether a loft conversion is a better option than other ways of extending your property. If other options, such as ground-floor extensions, are open to you, weigh up the costs and benefits of the various options. Talk to a local estate agent on how much value a loft conversion would be likely to add. 2) Check whether you will need planning permission. A good start is to visit the planning page of your local borough’s website. In some areas, e.g. conservation areas, you will need planning permission for some kinds of loft conversion. 3) Decide whether you want the simplest possible loft conversion or one incorporating a dormer window. The latter are significantly more expensive and may require planning permission. They will certainly add more value to your property and may be the best option for your family. 4) Remember that loft conversions take away existing space as well as adding new space. If you have been using an attic for storage you will have to find somewhere else to put your clutter. You may also have to sacrifice a small bedroom on your landing to make space for the stairs accessing your new loft conversion. 5) Get quotes from more than one contractor and check out their previous work in the area. There are plenty of reputable specialist firms but it is important to reassure yourself that you have chosen the best one. 6) Budget for possible overspend. “You will need a contingency fund of around 10 per cent for any problems that might come to light once work starts,” says Robin Chatwin, Head of Savillls, South West London. 7) If your loft conversion is going to be used mainly as an extra bedroom, make sure to install an en-suite bathroom. Nobody wants to clatter down the stairs in the middle of the night to use the bathroom. 8) Take a realistic view of how long the building works are likely to take. 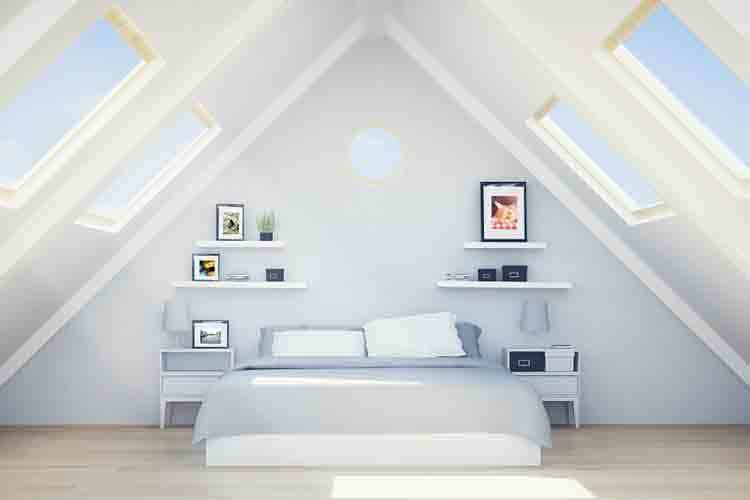 “The good thing about loft conversions is that the majority of the work can be accessed from the roof which minimises disruption,” says Lisa Simon, Head of Lettings at Carter Jonas. But you will still need to allow a minimum of six weeks, probably longer. 9) Make sure that your loft conversion satisfies the relevant fire safety regulations. Your builders should be up to speed on this important area, as will the planning authorities, but you will sleep easier at night if you acquaint yourself with the relevant regulations. 10) Remember to inform your insurers if you have added an extra bedroom to your property. This is a standard requirement of many house insurance policies. You only need to look around you to see that loft conversions have become an intrinsic feature of modern Britain. The best conversions both add financial value and create versatile living spaces – a true win-win. Content provided by OnTheMarket.com is for information purposes only.